Walker "Bud" Mahurin, an ace fighter pilot who was a war hero in Fort Wayne, died Tuesday at 91. 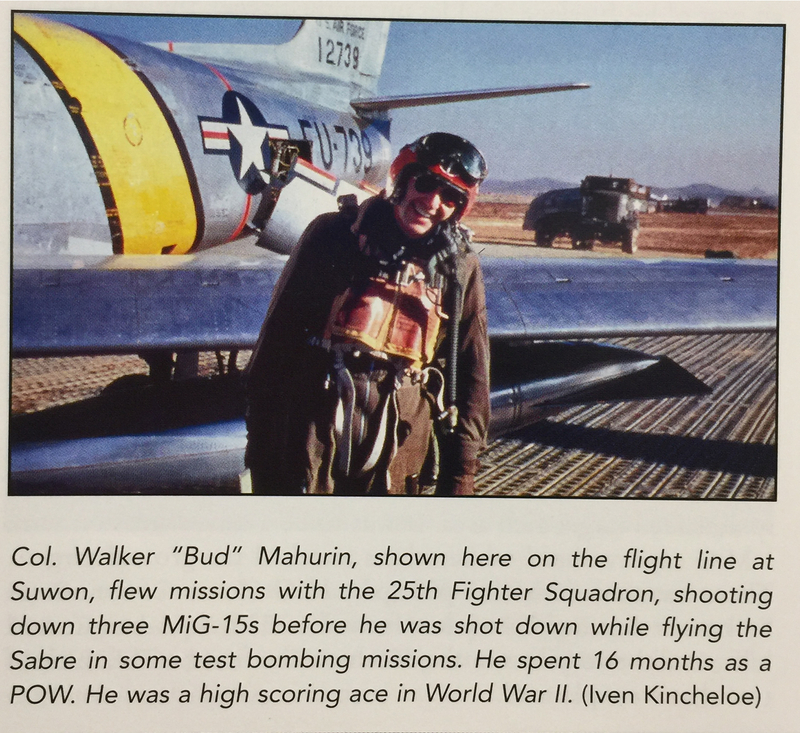 Walker "Bud" Mahurin was an ace fighter pilot and a war hero from Fort Wayne, the kind of person kids everywhere wanted to be like. 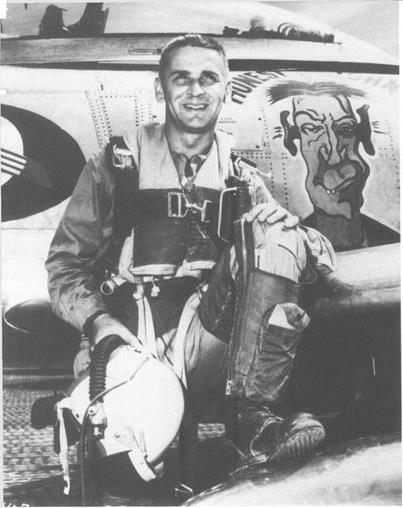 He was shot down twice once over France and later in Korea and escaped both times. He was responsible for 21 kills from the cockpit of his P-47 Thunderbolt in the European Theater of World War II and one more in the Pacific. Later, in Korea, he downed four Communist MiG fighter jets. The South Side High School graduate died Tuesday at his home in Newport Beach, Calif., after months of declining health. He was 91. Mahurin grew up at 927 Wildwood Ave. and never forgot his adventures traipsing across the city, said Joan Mahurin, his wife of 40 years. He started flying at a young age at Smith Field and later joined the Army Air Corps. His longtime friend Denny Sherman said he wrote to Bud Mahurin when Sherman was just a 12-year-old boy. Mahurin, then 22, returned to Fort Wayne from the Army one day and paid Sherman a visit. "He came with his mother's car and picked me up at St. Andrews School, and I thought he was God," Sherman said. God? Maybe not. But a hero to Fort Wayne? Certainly. Sherman remembers that the old downtown department store Wolf & Dessauer plastered a larger-than-life photo of him in a corner window on Calhoun Street for all to see. After he was shot down in France during World War II, he escaped to the United Kingdom with the help of the French Resistance. When he returned to Fort Wayne, the city threw a parade for him down Calhoun Street, Sherman said. He wanted to go right back to Europe and continue to engage in dogfights with Nazi pilots and defend American bombing raids. But the military brass was afraid his work with the French Resistance would make him even more of a target. So they shipped him off to the Pacific, where he spent the rest of the war flying a P-51 Mustang over Burma and China. 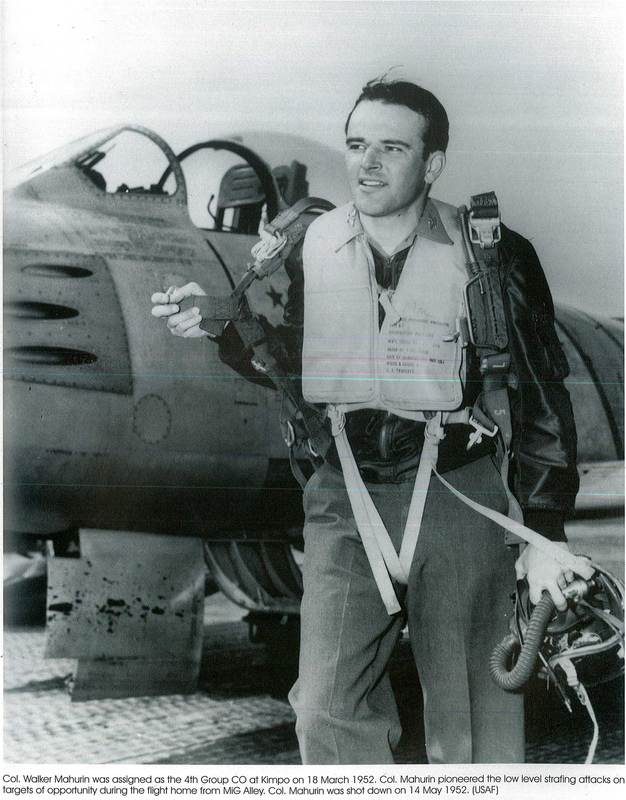 In the Korean War, he flew more than 60 combat missions and claimed 3 1/2 kills in his F-86 Sabre jet fighter. 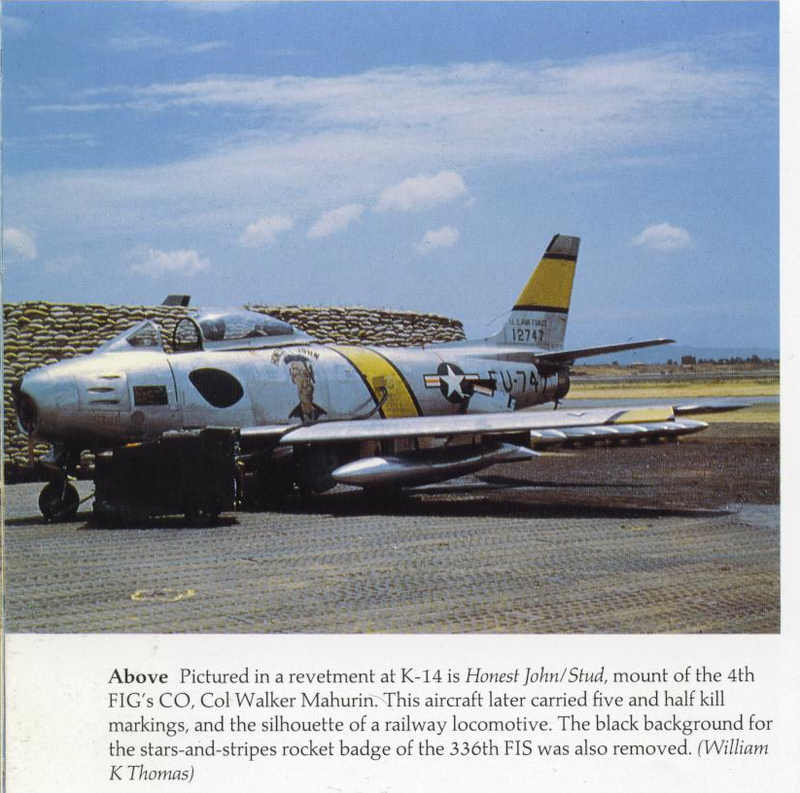 One dogfight he recounted, according to a statement from the 51st Fighter Interceptor Wing, had him diving after an enemy jet that broke formation in MiG Alley in January 1952. He peppered a Communist MiG fighter with machine-gun fire but had to retreat when others came to its aid. "On the ground, I found that several of the 51st pilots has seen the action I was in and watched the MiG I tangled with begin to smoke and saw the pilot eject himself, he recounted in the military statement. One of the smoke trails was my MiG. I got that Commie after all. 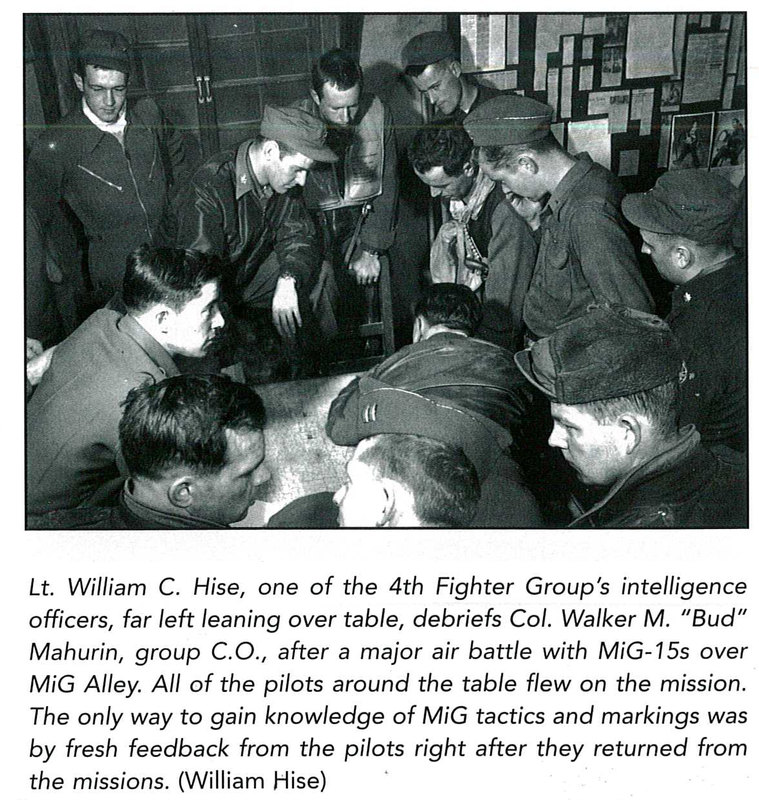 But in May of that year, Mahurin was making a strafing run against a Communist-held railroad when ground fire struck his jet and forced him to eject. He was captured by Communist forces and held until September 1953. He left the military not long after being freed, retiring as a colonel. He later worked for North American Aviation in California. Valeria Miller, Mahurin's stepdaughter, said he was modest about his achievements in war and talked about them only when asked. He preferred to talk about his family, his three children and seven grandchildren. and his cats and dog, she said. He continued flying until 2004, when a heart-valve transplant sidelined him. But that didn't seem to dampen his spirits much, Miller said. "He was one of the nicest, most down-to-earth guys you'll ever meet," she said. Mahurin will be buried at Arlington National Cemetery in Virginia with full military honors.